A tranquil pool just upstream from Sturtevant Falls, Big Santa Anita Canyon. A series of recent rain storms, albeit gentle ones, are helping to bring the Big Santa Anita Canyon and Winter Creeks back up a bit. As of mid-January, we still haven’t seen any big storm systems hit the San Gabriels. Generally, a larger storm for the Chantry Flats area and most of the front-country, would be anywhere from 6 to 12 inches of rain…. or more. Back when I worked at Sturtevant’s Camp, there was an old L.A. County Flood Control rain gauge out at the heliport. It was a great spot for getting accurate reads of storms since there were no overhanging branches from the dense trees to throw off the true amount of water coming down from the sky. I had a chance to record 20 years of rainfall totals, and it was interesting to say the least! The driest years were in the neighborhood of 11 (2002)to 20 inches total at Sturtevant Camp’s 3,200′ elevation. The wettest ones broke the 90 inch mark (2004-2005). Average years tended to be somewhere between 40 to 55 inches of accumulation. 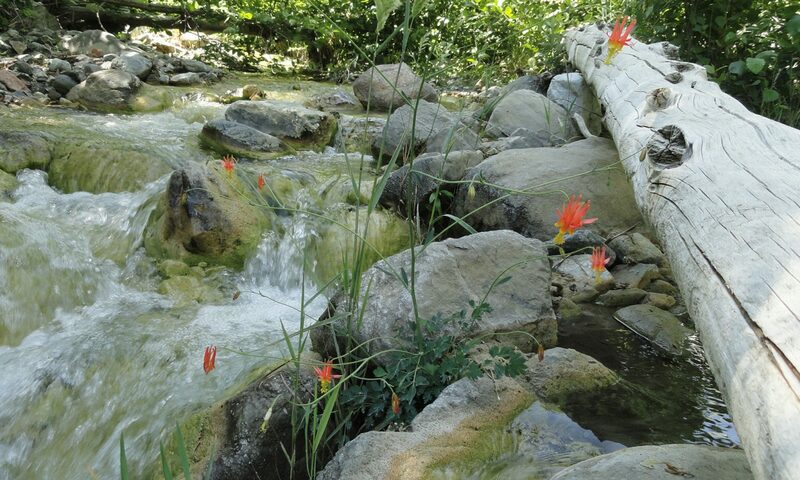 The snow level in the Big Santa Anita and Winter Creek Canyons tends to around 4,000′ up. So, at Sturtevant’s, while snow did occasionally fall, mostly what I experienced was cold, hard rain. It’s rain and snow, percolating down through the fractured and porous aquifer, that sustains our year-round stream. Although many side canyons only flow seasonally, the Big Santa Anita and Winter Creek flow throughout the driest of years. The watershed below Mt. Wilson is made up of myriads of steep, twisting canyons and all aspects of slope. This steep and tumbling country, heavily wooded, has an extensive surface area that can collect moisture and store it for years. A number of Angeles Forest trail maps that depict the routes up and around Mt. Wilson are available online, at outdoor retailers and the Adams Pack Station. It’s a good time to get out and explore this beautiful mountain. Previous PostPrevious Merry Christmas from the Big Santa Anita Canyon!